This is a classic American Hard Rock album with all the standard contents as driving grooves, chatchy guitars and with a tough singing voice. 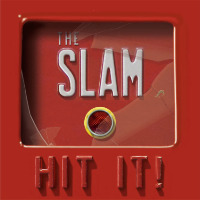 In the first track "Wild Ride" on the album "Hit It!" with The Slam, they got me hooked up and I'm very on at once from the first listening on and I love the sharp guitars and the heavy drums with the powerfull vocal contribution. The rock giant Glenn Hughes appears on the bluesy track "Little Angel" and he does a great performance on it and it's a pity that it was the only track he performs on the disc. In "Bad Blood" it sounds like an AC/DC song with a lot of power and nice guitar solos and it's one of my favourites songs on this album. But in the radio flirting song "Tears In Heaven" and in the some more rockier track "Kisser" it feels like I've heard this hundred times before. It feels pale and colorless, but in "90-50-91-Love" it turns back to a more heavy sound again and it got a easily digested chorus. And the next track (Push On) it's another track with sharp guitars and a nice groove. In "Saddle the Moon" it's the guitar playing that saves the track from the skip button. The last 2 songs is not "Hit It! "-s most momorable tracks, so overall it got some really good tracks, but sad to say, it feels like several songs are fillers on the album. I usually like these bands with good melody and a lot of guitar licks, but I find it hard to appreciate all of The Slam's new album, so I'll recommend if the possibility exist to buy track by track over the Internet instead. The best tracks : Wild Ride, Bad Blood, Little Angel and 90-50-91-Love.